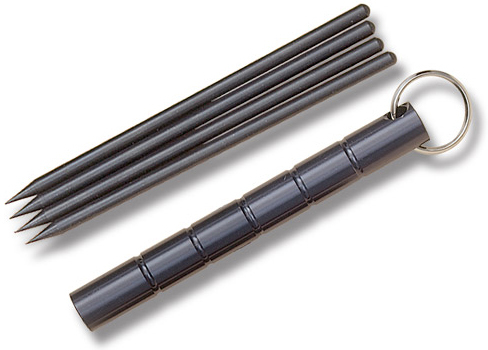 5.5" kubaton with 4 Ninja Throwing Spikes hidden inside, with keyring. This 5.5" black Kubaton is hollow on the inside and screws open. It comes with four 4" ninja spikes. They have pointed sharp tips. The kubaton has a key ring so you can easily take it anywhere. Secret hidden weapons on a keychain!